A diamond watch is more than just a timepiece – it's a piece of beautiful jewelry. It's a perfect gift for many occasions, such as a wedding. Top models from Audemars Piguet or Hublot feature cases, bezels, and bracelets fully covered in diamonds. A diamond watch makes many women's hearts beat a bit faster. There's a reason Marilyn Monroe sang "Diamonds are a Girl's Best Friend." Diamonds are long lasting and will accompany a woman throughout her life. If you want to give your darling a watch as a gift, then a women's diamond-set watch is the right way to go. However, diamond watches aren't just limited to women. 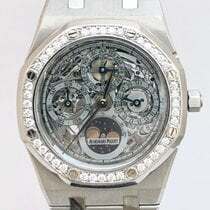 Men's models such as the Audemars Piguet Royal Oak Offshore with reference number 26403BC.ZZ.8044BC.01 are completely set with diamonds. The watch's 44-mm case is the perfect size for masculine wrists. Costing over 1.4 million euros, this model is already incredibly expensive. It's only topped by Hublot's 5 Million Dollar watch. This timepiece features over 1,200 diamonds at a total of 140 karats. Seventeen Hublot employees worked for 14 months to produce this timepiece. The 5 Million Dollar watch costs about 4.5 million euros, making it one of the most expensive watches in the world. Most diamond watches, whether for men or women, feature gemstones on the bezel or dial, such as Rolex's diamond-set watches. The Datejust model is available in many different versions. Some of the women's watches feature diamond indices. 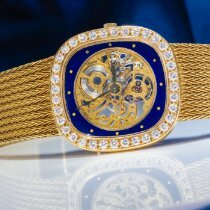 The Swiss manufacturer often uses a combination of stainless steel and gold for the cases and bracelets of these watches. Eighteen-karat yellow, white, or pink gold watches are also available. A diamond-set watch is a solid investment due to the gemstones and use of gold or platinum. How much do diamond watches cost? The choice of which diamond watch you purchase depends heavily on personal taste and budget. There are countless types of diamond watches to choose from. Do you want a refined, conservative timepiece with diamond indices or are you looking for a hip, iced out watch with diamonds on the case, bracelet, and bezel? Pre-owned diamond-set quartz watches from Ebel are available for less than 1,000 euros. These timepieces often feature 12 small diamonds as hour markers and stainless steel cases. You can occasionally find diamond-set quartz watches from Omega in this price range as well. You should be prepared to spend at least 2,000 euros on a white gold, diamond-set Omega women's watch. If you're considering buying a luxury watch, you have to consider Rolex. Timepieces from this Geneva-based manufacturer are the epitome of status and prestige. Rolex watches are always in demand, men's and women's alike. Pre-owned diamond-set vintage watches are available for around 1,800 euros. Often, the models in this price range are the Datejust. You can find timepieces with diamond indices for around 2,000 euros. If you want a diamond-set bezel, then you should plan on spending 2,500 euros. A new diamond Datejust costs 6,500 euros. The Cosmograph Daytona has been one of the most beloved Rolex watches for a long time. The so-called Paul Newman is especially in demand amongst collectors. It's difficult to find this vintage chronograph for less than 100,000 euros. The diamond-set Daytona is much more affordable. These varieties are usually made of 18-karat gold or a mix of stainless steel and gold. Diamonds are utilized as hour markers. The bicolor version costs around 10,000 euros pre-owned, while it costs 14,000 euros new. You can purchase a gold, diamond-set men's Daytona for about 16,000 euros. These versions have a leather strap, and the timepiece is often in very good condition. If you want a solid gold Oyster bracelet, you should plan on spending at least 20,000 euros on a pre-owned watch. New, these gold watches cost around 26,000 euros. The Daytona has also been available in platinum since 2013. Rolex first introduced this model for the chronograph's 50th anniversary. The platinum watch has some distinctive features, such as a chestnut brown ceramic bezel and an ice blue dial. The dial is also available with a total of eleven diamonds as indices. New models cost over 50,000 euros. The Swiss watch manufacturer Breitling is known for their pilot's watches and chronographs. Two of their most successful models are the Navitimer and Chronomat. The Chronomat is available with a diamond-set bezel and dial and usually costs around 5,000 euros pre-owned. New, it costs double that. The "Diamondworks" Chronomat models have diamonds on the dial, bezel, and case. You should plan on spending around 45,000 euros for one of those models. The Chronomat has distinctive bezel rider tabs at three, six, nine, and 12 o'clock and an onion-shaped crown. You can find pre-owned diamond-set Breitling women's watches for around 1,500 euros. These watches are usually powered by precise quartz movements. Prices for new timepieces from the Colt or Galactic collections, for example, start around 4,000 euros. Cartier is a world-renowned luxury brand. The French company is known for their accessories, jewelry, and watches. Their most highly sought-after watches are the Pasha, the Tank, and the Santos. The Santos was one of the first pilot's watches ever created. Cartier watches have beautiful designs, making them more than just watches; they're pieces of art too. You can purchase a pre-owned rectangular Tank in very good condition for around 2,500 euros. Most of the watches in this price range have stainless steel cases and straps and are powered by a quartz movement. Countless diamonds grace the front side of the case. A new stainless steel Tank Française with diamond indices costs around 4,200 euros, while the bicolor version costs 6,000 euros. A pre-owned stainless steel Santos with a diamond-set bezel costs around 2,500 euros. A new white gold Santos with a diamond-set bezel and lugs costs around 18,000 euros. 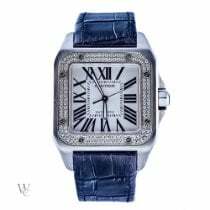 The Panthère is a popular women's watch from Cartier. This model is dedicated to the company's logo, a panther, and was inspired by the animal's litheness. Current models include those with a rectangular case and five-link bracelet. Panthère watches set with diamonds aren't just timepieces but beautiful pieces of jewelry. Versions made of 18-karat pink gold with brilliant-cut diamonds on the case have a feminine, elegant feel. You can purchase pre-owned diamond models from this collection for around 4,000 euros. New models cost at least 10,000 euros. Hublot watches are some of the most exquisite timepieces in the world. The Nyon, Switzerland-based manufacturer is famous for their distinctive porthole watch designs. The Big Bang is one of their most popular series. A diamond version of this chronograph is a highlight amongst Hublot watches. Versions made of red gold with a diamond-set bezel cost around 32,000 euros new. 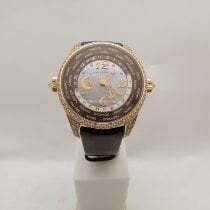 There are also models with cases and bezels completely set with gemstones; the Big Bang Unico King Gold Pavé, for example, features a total of 290 diamonds. One hundred and seventy-six of those diamonds are on the 45-mm red gold case, while the other 114 are on the red gold bezel. You should be prepared to spend about 60,000 euros on one of these unworn watches. Like Cartier, Chopard is one of the highest quality producers of jewelry and watches. The timepieces from this Geneva-based manufacturer are predominantly classically elegant, although they also offer sportier models. Chopard quartz watches set with diamonds from the 1990s are comparatively affordable, costing only around 1,500 euros pre-owned. The women's models, above all, are decorative accessories. The Chopard L.U.C XP is available in white or rose gold with diamonds on the bezel, dial, and case. New, this classic model costs about 40,000 euros. The Mille Miglia Classic Chronograph is a bit sportier. Like its name suggests, this timepiece has a stopwatch. It's certified by the Official Swiss Chronometer Testing Institute (COSC), guaranteeing it runs precisely. 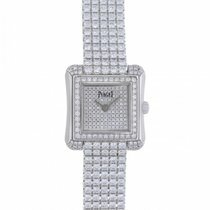 This stainless steel watch features a diamond-set bezel and a white rubber strap with a tread pattern design. This model costs almost 8,300 euros. The Happy Diamonds collection features dazzling watches adorned with diamonds, transforming them into precious pieces of jewelry. Prices for pre-owned quartz-powered watches start around 1,000 euros. If you want to purchase a new women's watch from this series, then you should set aside at least 4,500 euros. Diamonds are the most famous of all the gemstones. This incredibly hard mineral is made of crystalline carbon and is created 300 to 400 km below the Earth's surface where temperatures around 1400 °C and incredibly high levels of pressure are the norm. Occasionally, the pressure builds up and causes an explosion, shooting lava and the rare gemstones to the surface together. Diamonds are incredibly scarce. Their weight is measured in karats; one karat is equal to 0.2 g. A brilliant diamond refers to a diamond with a brilliant cut, a cut known for its shine and light refraction.